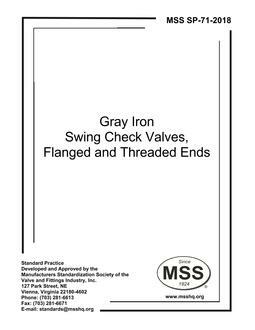 MSS SP-71-2018 covers gray iron swing check valves with flanged and threaded ends for general purpose service. The use of swing check valves in steeply inclined or vertical lines requires special consideration. This Standard Practice also includes, directly or by reference, stipulations on chemical and mechanical properties of materials and dimensions of end connections in common use.